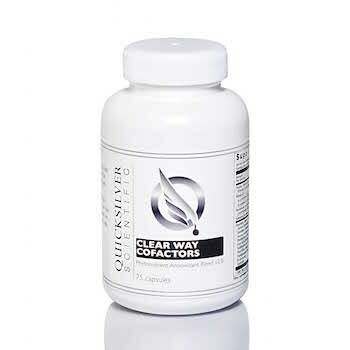 Clear Way Cofactors is a proprietary blend of phyto-extracted polyphenolic antioxidants, R-Lipoic Acid, targeted vitamin B’s, selenium, kelp extract, and high-potency Natto-kinase designed to maximize metal detoxification pathways. The only way to truly optimize the function of the glutathione system is to stimulate the production of the system components from within the cells. Polyphenolic antioxidants such as Epicatechin (found in pine bark and green tea extracts), have demonstrated tremendous efficacy in doing this by “turning on” a cellular master switch called the Nrf2 protein. This protein turns on the cellular production of several antioxidants and detoxification molecules.1 Polyphenols have the added benefits of high anti-inflammatory properties, anticarcinogenic activity and passage through the blood-brain barrier. • Haritaki is the polyphenolic-rich fruit of the Terminalia Chebula tree. Haritaki is widely used in Ayurvedic medicine where it is held sacred to Shiva. It is pictured as the quintessential healing plant in depictions of the Medicine Buddha in Tibet, where Haritaki is called “The King of Herbs.” Haritaki was recently shown to have extraordinary effects on the antioxidant and detoxification systems. • Pine Bark Extract is the richest source of epicatechins (the building block of OPC’s – oligomeric proanthocyanidins) and powerful anti-inflammatory, cardioprotective glutathione builders. • Pomegranate Extract, a rich source of ellagic acid, which has shown impressive activity on glutathione synthesis and glutathione S-transferase activity. • Gotu Kola and Bacopa Extract is added for nerve detoxification, protection and stabilization. • Dandelion Extract is added for liver protection and to stimulate adequate bile and urinary flow. • Kelp Extract is added for iodine/other trace minerals and polyphenolic content. components of the formula, high-potency Nattokinase (2000fu) is included to help break down biofilms in the gut. These biofilms prevent detoxification and absorption of nutrients as well as lock in dysbiotic intestinal flora. Directions: Build up to 3 capsules per day gradually. Advanced doses of 6-9 caps per day can be used for short periods. Best taken on an empty stomach; if upset occurs, take with meals. 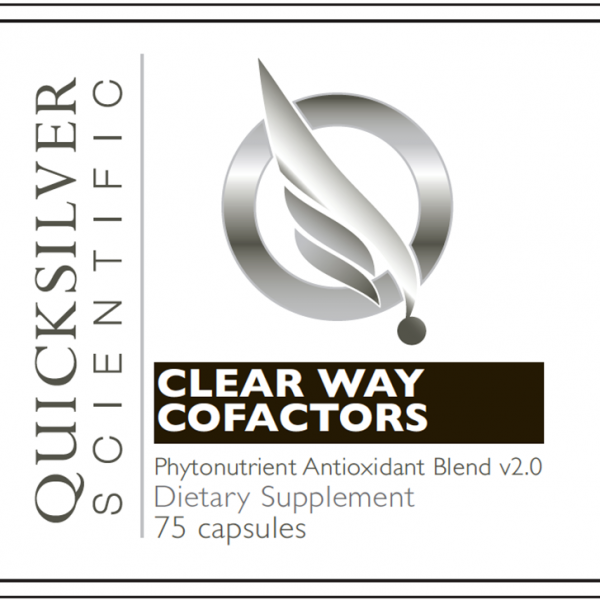 In combination with the core products glutathione, EDTA w/ R Lipoic Acid and IMD for heavy metal detoxification, Clear Way Cofactors is a splendid adjunct to be combined in a regime. You may Contact Us for more information on how to approach a heavy metal detoxification program and we will advise you appropriately on the right doses e.g. for a 3 month detox it could be 2 caps a day for 1st month, 4 caps a day for 2nd month, 6 caps a day for 3rd month. 1. Kwak, M-K., Wakabayashi, N., Kensler, T.W., Chemoprevention through the Keap1-Nrf2 signaling pathway by phase 2 enzyme inducers. Mutation Research, 2004, 555, 133-148. 2. Mahesh, R., Bhuvana, S., Begum, V.M.H., Effect of Terminalia Chebula aqueous extract on oxidative stress and antioxidant status in the liver and kidney of young and aged rats. Cell Biochemistry and Function 2009, 27, 358-363. 3. Shepherd, A.G. Manson, M.M. Ball, H.W.L., McLellean, L.I., Regulation of rat glutamate-cysteine ligase (γ-glutamylcysteine synthetase) subunits by chemoprotective agents and in alfatoxin B1-induced preneoplasia. Carcinogenesis 2000, 21, (10), 1827-1834.